I've avoided the 'Brook' for a month or so now, I've had a holiday in that time and also bagged myself a river carp from Wasperton. The rivers have also been low and clear and not ideal condition for the Barbel especially as it's been hot too. The weekend and yesterday morning however brought some much needed rain showers and therefore some colour in the water. I was suprised when I got the car park to find no one there, the plan was to fish from 7.00pm till dusk. I've usually trotted for the first part of the session and then fish a static bait for the last hour. Today though was a bait and wait approach with some big meat baits. Garlic spam has out fished lots of fancy baits for me and this was the bait I was going to start with. When I got to the river it was a good 1/2 a meter up or so and the colour was just right, coloured but still with some clarity. My intended swim I couldn't really fish as it was underwater so I ventured back upstream to a swim I've caught Barbel before. The is a nice crease down the middle with slack areas either side and it was the slack areas I was going to position the bait. I balled in some scaled pellets and also had some moulded around the gripper lead. The meat received attention as soon as it settled with lots of knocks on the rod tip and within 10 minutes I had a nice Chub on the bank, not a huge one by 'Brook' standards but a minter. Big meat baits are hard to beat especially when the water is coloured and the way I make mine is simple. I cut the garlic spam in half and then use small pastry cutters which are around 12, 15 and 30mm. You can see the lone angler sausage sizzle squabs below which are 14mm so you can see just how big some of the baits are I use. Within the first hour or so I had another 3 Chub just by alternating the slack areas I was fishing, nothing that big which was odd, most I catch here are over 3.5lb but the biggest only went 3.2lb. Decent fishing so far and I'll be happy if that's all I had but not long after returning a Chub, the rod violently wrapped round, the centrepin ratchet singing and I was playing a Barbel. The 1.75lb TC rod was bent to the cork as the fish was trying to get in to the far bank cover and my arm was starting to ache. Amazing isn't it just how powerful these fish are, it's only when you see them intercepting food in the flow of a river you understand why, they are pure muscle and super fit. I was suprised when seeing the fish that it wasn't a big'un, it only weighed 6lb 1oz but again another stunning condition fish. Chub seem to give up quicky after a fight but Barbel fight all the way to the net, that's why they always need resting in the landing net before returning. If you don't rest them they will quickly go belly up. The Barbel will tell you when they are fit to return so don't be in any rush, it might take 2 minutes it might take 15. I manged another Chub at last knockings so a nice evening was had by all. I left the countless nats, bats, slugs and spiders to it and went away happy. I didn't even use the squabs, garlic spam worked today, it really is a bait I've got confidence in. It's a Shanghai match Friday at Little Geary's at Packington but I might try and nip in another quick evening session this week. I had the whole stretch to myself again today, madness, but that's why I love it here. I think early mornings are Carp'O-Clock on the Avon as yesterday evening it was like they had all disappeared. None showing on the surface and not even a line bite on the sleeper rod. I worked out I've spent 17 hours on the bank for one fish. It's a bit of a trek too, 1/2 a mile from the official car park. 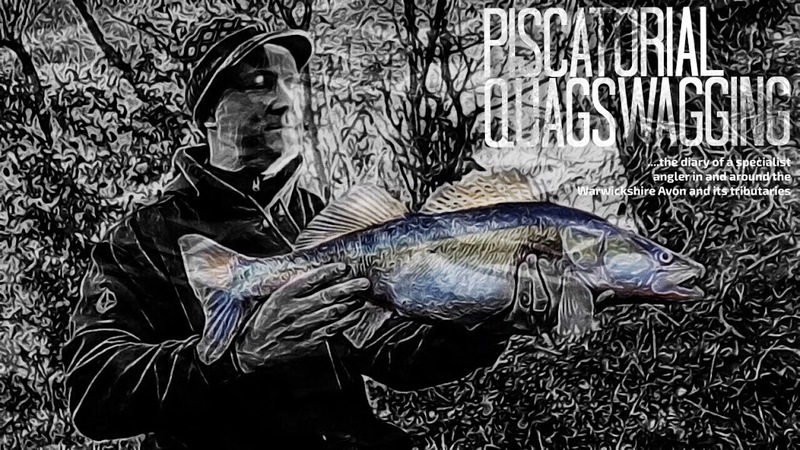 I've seen quite a few pike whilst I've been here so going to give this stretch a go in the winter, it's deep, slow and ideal for trotting a deadbait under a float. What next, not sure might have another go at the Crucians at Snitterfield Reservoir or have a venture back to the Brook. A few hours this morning just proved frustrating, the carp were certainly feeding on the surface when I got to the Warwickshire Avon Carp Haven but I just couldn't catch another one. I still cannot believe just how many there are just in this one short stretch. They are crafty little things though, I even had one of the biggest carp come out from his sanctuary like a laser guided missile and engulf the whole lot of my bread crust and somehow eject the hook without even a pull on the rod. These Crafty Carp have got my mind of the Barbel, which is probably a good thing, as it doesn't seem anywhere is fishing that well at all.I've got to catch one of the big'uns though, fishing shouldn't be easy now should it, that's what it's all about in my opinion, I want challenges. I've just come back off holiday with the family in Brecon but last Friday morning managed to catch an elusive river carp after a few times trying. Not quite a double, just 9lb 15oz but as it's my first river carp it's a PB. The venue is slow, deep, full of lilies and is home to decent size carp. Locating them is the key and after catapulting a few dog biscuits in various likely places I waited and watched. Didn't take long either as they were showing on the surface after an hour or so. You honestly wouldn't know fish that big would be in the area unless you knew. I bought two rods, one a float set-up to fish some bread on the bottom and also a rod with a fox bubble float to fish some crust on the surface. I wanted to keep the float static, I remembered watching one of John Wilsons programs where he rested a bit of peakcock quill on a lily pad. I did exactly that, a tad crude but a good way of resisting the flow and there would be no doubt when you had a bite. A few carp were grubbing about in the margins so an ideal method. The water was gin clear and there were two ghost carp that stood out like beacons, and one of the carp looked a foot thick, it was massive. It's a 3ssg float and all the shot was a couple of inches from the hook with a bit of crust on a big hook, what carp could resist. For half and hour or so not much happened but then you know what it's like, sods law sometimes comes in to play. The Wife rang me up and literally as I answered the float shot under, the centrepins ratchet was singing and a mini tsunami appeared around the now invisible float. The Wife could wait so in the panic the bait bag was kicked over, the phone was thrown on the ground and I was playing a decent carp. The problem was it managed to take far more line than I liked and it got amongst some thick roots. It wasn't budging. I let the fish settle for a few minutes and eventually it was pulling on the end of the rod tip, it still wasn't budging though and eventually it made the most of it's haven and it broke me off. I thought that would be the only chance I'd get but with swim disturbed I moved 100ft downstream where I spotted a quite a few sunning themselves. I threw some dog biscuits upstream and they were soon up in the water feeding off them. I gave it a good half hour before lowering in a bait and this time the bread was to be fished on the surface. I love surface fishing and I've lost count the amount of times I've fluffed strikes. These days I like to use a water filled bubble float and allow the weight of the float to hook the fish, no striking and it's a method that seems to work really well. I cast the float upstream and it slowly meandered down the river and I teased the line so the float stopped on a lily pad with the crust a metre away from the float. The smallest fish in the swim was more active than the rest and within only about 2 minutes the bread was engulfed and the fish was on. I had to bully the fish really the swim didn't allow me to play it, so it was on the bank pretty quickly. 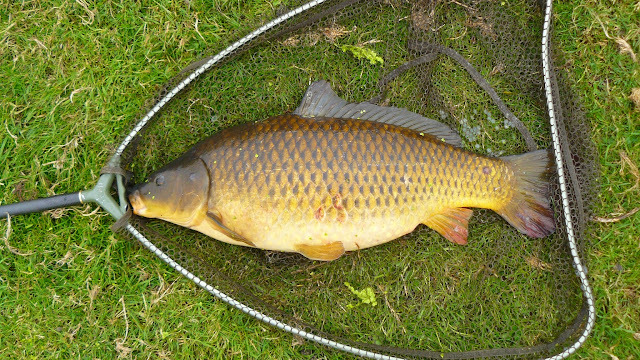 A decent fight though and a stunning coloured common. With the weather looking like it's going to be nice for another week at least, I'm planning to go back and try for a bigger one. No better time at the minute and might as well make hay and all that. With the summer here and the lily pads at their largest I know a swim on the Warwickshire Avon where I'm guaranteed to find them, there are some big un's that reside here too. I've seen carp feeding amongst the Nymphaeaceae that would easily beat my 18lb 7oz PB. I'm not a Carp angler by any means and to be honest I prefer fishing more intimate parts of the River but I've just got to catch one of them, it's on my to do list. I haven't been down to this stretch of the Avon for ages, it's wide, slow and deep and it's often somewhere you will blank. At the end of this stretch is where the big carp reside and where it gets interesting. On route to the location a Buddhist Monk was walking over the bridge in Hampton Lucy, and he turned up again on the opposite bank walking past the weir. You never know what's on your doorstep do you as after a bit of googling looks like he was walking back to the Forest Hermitage, a Buddhist retreat which is in Lower Fulbrook not far from where I was fishing, they are even on twitter. The intended tactic for today was to pre-bait a swim and fish it for the last hour, a simple bolt-rig with a CC Moore Odyssey boilie as bait and then to start with to surface fish some bread just to the edge of the lilies. The lilies are so thick here and the carp so big it would be madness to try and fish within them and often that's where they are found. I wonder how many anglers have been down here not knowing there are some monsters that lurk within. The lilies provide cover from the sun for these fish and it's also a natural food source. It didn't take long yesterday through my polarised sunglasses for me to spot a few big carp, a couple literally a foot or so from the bank in lilies so thick it covered most of the surface. A few floating freebies were scattered to try and bring them out to a clearer part of the swim, to gain their confidence and then eventually lower in a baited hook. Like most of my fishing didn't really go to plan though, not only did they not venture from the thick cover as soon as they got anywhere near the edge of their security they shied away. They disappeared for half an hour to turn up again in the thickest part of the floating leaves, the bread didn't even get a look-in. For the last hour I lowered in a semi-fixed bolt rig but again the odd rattle on the rod tip but no sadly no runs. 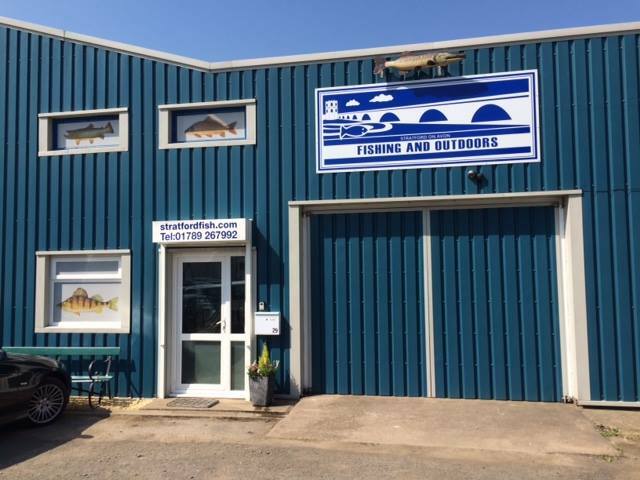 I don't like my fishing to be easy, I want a challenge, that's what fishing is all about, I remember when I caught my fish Barbel I was on a high for days. I could could give another part of the Avon a go and I know there are some carp that reside on the Warwick book waters but I've fished this part of the Avon since I started fishing the river in this area 5 years ago, if I'm to catch one it has to be from here. Having watched them take insects I'm wondering if zig bugs would be worth a try, natural looking and an anglers bait they probably haven't seen before, not sure I'd fish them zig style but on the surface a few feet from a controller float. I'll be back and please, any tips welcome. ....said the old fella who I go talking to at Snitterfield reservoir, after a suggestion by myself that surface fishing is always worth a try at this venue the tactic was instantly dismissed even though there was about 6 carp cruising just below the surface. I half expect a cane rod and piece of peacock quill fished lift method style just by some lily pads, but no traditional carp fishing apparently is to sit behind bite alarms, big test curve rods with boilie baits fished on the bottom. I'd have thought his admission that the reservoir isn't really a carp fishing venue and the fact he blanks more often that not but does get a few runs in a day session would make him change his tactics or switch venues. Anyway back to the fishing, with my favorite peg occupied I settled in peg 33. I was fishing with a small method feeder on both rods with enterprise fake casters as bait. 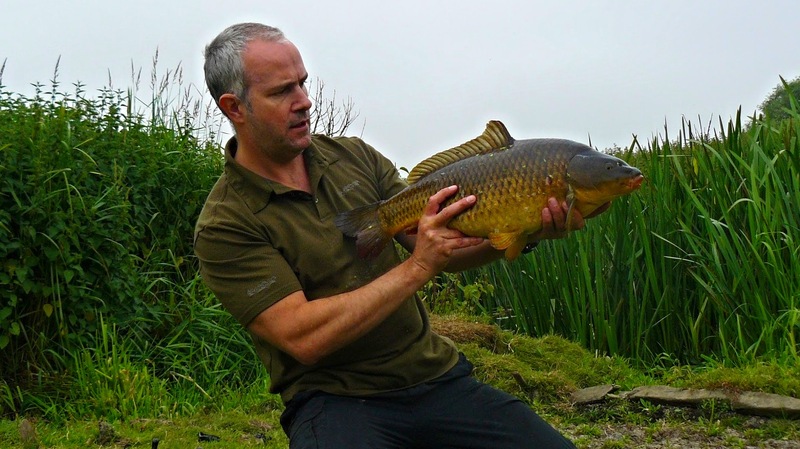 The intended species was the Crucian carp and this reservoir holds some good'uns. I usually fish the evenings but such a busy weekend that was ruled out. The reservoir looked much lower then when I fished it a few weeks ago with much of the weed beds exposed. I've never really used fake baits before but fellow local blogger Danny Everitt was having some decent results I thought I'd have a go. The method groundbait contained some hemp and was fished just up the marginal shelf. Crucians we all know can be such frustrating feeders, I usually float fish with reasonable success but a mini bolt rig style set-up should reduce the frustration, not really cricket I know. The fish fish to fall for the fake casters was a small crucian, great so they work then and I manged another 5 or 6 crucians of similar size. However it seems every other fish like then too as I caught bream, roach and tench too. The two roach were just a tad over a pound in weight, hmm might have some merit this method to single out the bigger fish as I didn't catch any proper tiddlers. Not a big crucian today but the method has given me confidence and I'm going to use it again. After I spoke to Mal the chairman last week please always use the official car park when you fish the Brook, the club have invested in a good combination lock and the code is in your Stratford book. Not only does it make it easier to tell if you a member or not it gives the farmer less of a reason to complain. I've been guilty of parking on the area before the gate in the past but as the lock and gate is now sorted there is no excuse. It only takes me 8 minutes to get to the venue , 10 today as I stopped to get a picture of the field full of rapeseed. You can just about see the Welcombe Hills monument in the distance, it was Erected in 1876 by Robert Needham Philips to honour his brother Mark Philips, this obelisk on the hill above the Welcombe Hotel is visible for miles up and down the vale of the Avon. Welcombe was once part of the chief manor of Old Stratford and in Shakespeare’s time the Combes family had a considerable estate here. In 1845 Mark Philips, son of a northern industrialist purchased Welcombe Manor and in the 1860s rebuilt it as the family seat. Today this forms the Welcombe Hotel. Mark Philips was also notable as Manchester’s first Member of Parliament. If you're in the Stratford area go and have a butchers. Anyway back to the fishing, I stupidly left my luncheon meat and hemp in the garage so only had sausage sizzle squabs in my rucksack. Not a touch in a few swims for a couple of hours, it was only when the bats started to stir and the sun was going down when things started to happen. The fish started to top and I was having the odd indication on the rod tip. Within 15 minutes of each other I had banked two Chub, the last one weighed 4lb 4oz and wrenched the rod over so much I thought it was a Barbel. Slow going this evening but then I rarely blank at this venue so I cannot really complain. Bazal Peck has started to fish this venue too and looks like he is enjoying his time here as much as me and it's also nice to know how other anglers are getting on. I'm giving the Brook a rest for a few weeks and plan to fish other venues. A trip to the Reservoir and Wasperton are on the cards. I had a few hours yesterday evening trundling some meat down some new swims down the 'brook', I arrived at the first swim to see the dark shadows of a Barbel and a few Chub coming up in the water to grab what was coming down the current so I fed some hemp and corn for 10 minutes or so before I dropped in the baited hook. A simple set-up loafer float between some float stops, a cheap garish centrepin off Ebay and big lump of meat on the hook and 3 swan shot 6 inches or so from the bait to keep it dragging bottom. First fish to take a liking to the piece of meat was a Pike of around 5lb, the greedy little water wolf put up a decent fight before his numerous sharp teeth broke the line. The swim went quiet so I moved to the next peg down and again didn't take long for the first Chub to arrive. I haven't really given trotting that much attention but it's a method I'll give a go again. They properly nail the bait too so you cannot really miss the bites. In three hours I landed 8 Chub all over 3lb, no Barbel today but I've always found August to be more productive. I've the rods set-up for a reservoir trip this week but I'll be back to Brook as soon as I can as there is one particular swim I want to try as it screams Barbel.